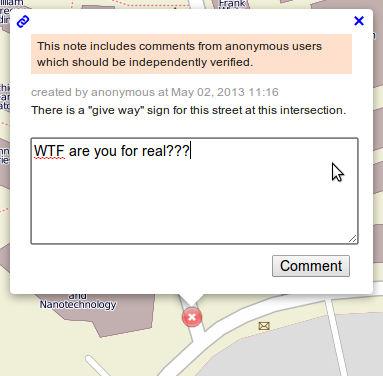 How to contribute to OpenStreetMap without editing the map? | goFLOSS! 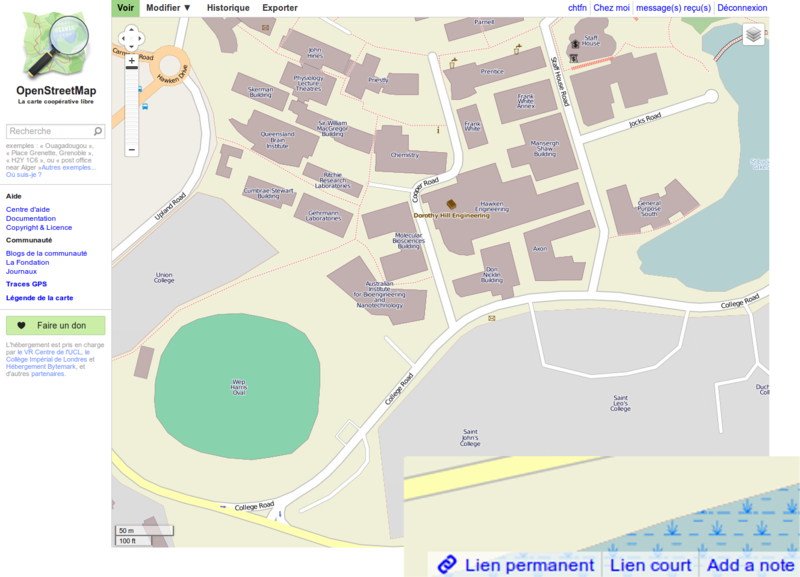 How to contribute to OpenStreetMap without editing the map? OpenStreetMap (OSM) is an amazing project that aims at building an open geographical database of the whole world. It started in 2004, and the project offers now a very rich and usable database for everyone to enjoy and use, as many different websites do to offer services (nautical map, bike itineraries, map of the nuclear facilities in the world – you name it). Even though it is very easy to start editing the map and adding, for example, your own house, some people just want to point out that there is something missing or an error somewhere. 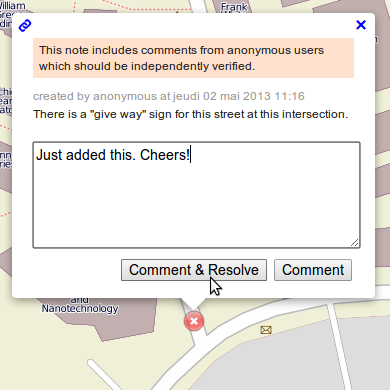 This was made possible by OpenStreetBugs, a separate website that lets people add comments on the map. However, as I read three days ago, the main website now offers the same option, which is a very welcome addition to it. Here is how to use the new built-in note function. Head to this link to reach the main OSM portal. Now, you can see (yes, look harder!) in the bottom right-hand corner a little “Add a note” link. See the link at the bottom right? I zoomed it for you. I’m nice. Find on the map the place where you noticed an error, and click the link. You can now drag and drop the green cross symbol at the right place, and enter a precise description of the issue. Click the link, move the green cross and describe the error. You can now confirm by clicking “Add note” and let people see your contribution. For the moment, users can see the notes mainly by using the main website and ticking the “Browse notes” box that is available in the layer picker (the stacked squares in the top right-hand corner). 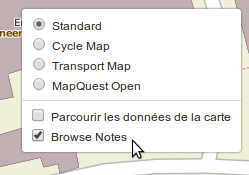 This is how you can reveal the notes contributors added on the map. By clicking on the note, they can see the description and also comment on it if they feel like it. If you have an OSM account, and you were logged in at the time of writing it, you will get a notification if someone interacts with it. OK, this is NOT a valid comment. Please be constructive. After that, people can fix the problems you pointed out in the database. 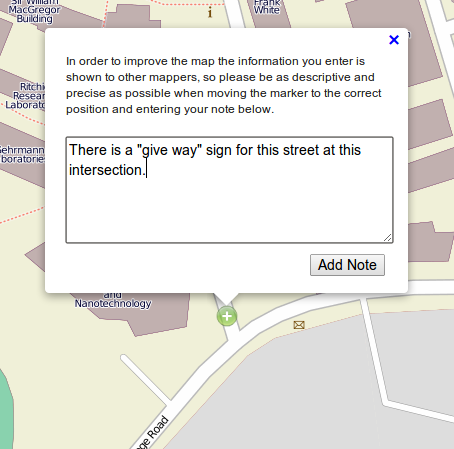 Here, the user is using the software JOSM to add the missing “Give Way” sign. And here, doing the same with OSM’s website’s built-in editor, Potlatch 2. After that, the registered user who fixed it can head to the website and mark the note as “resolved”. The registered user marks the note as resolved, and can comment on it too. A little “Thank you” is always very much appreciated! The note then shows the “resolved” blue icon. There you go! Hopefully you can use this wonderful map more often, and give us a hand by pointing out the odd error! 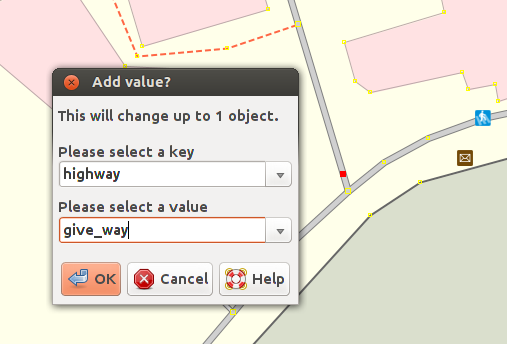 You can also learn more about this new feature on OSM’s wiki. ← How can I help the Free and Open world?